Borba gra-Uzgash is an Orc trader and the proprietor of Borba's Goods and Stores in Cheydinhal. Borba gra-Uzgash sells a wide variety of general goods including the unique Cowl of the Druid, which can be purchased here and nowhere else. She will also sell you upgrades for your house in Cheydinhal. In addition to being a retired adventurer, she is a member of the Orum gang, a local skooma-ring with ties to the Camonna Tong. With the exception of the many gang members paying daily visits to the shop, Borba's store bears no evidence of her affiliation with the illegal activities going on in Cheydinhal. Like many other merchants in Cyrodiil she lives a hard life with a twelve-hour workday and very little spare time. She wakes up at 6am and spends the first two hours of the day in the main trading room before unlocking the door for customers at 8am. She locks the doors again at 8pm and takes the short walk to her next-door neighbor, the Newlands Lodge, for a two-hour dinner with the other gang members. At 10pm she returns to her shop for a bit of relaxation before her bedtime at midnight. Borba carries a few gold and an iron dagger. She wears middle-class attire consisting of a russet felt outfit and a pair of quilted shoes. She also carries the key to the store and a spare pair of burgundy linens. If you pay a visit to her shop, she will, when compared to the other members of the Orum gang, prove to be friendly: "Borba gra-Uzgash. We've got everything the adventurer needs. I'm an old adventurer myself, and I know what's wanted." If you ask her about Cheydinhal, she will add several markers to your map, including Rickety Mine, Kemen, and Quickwater Cave, for places where she used to go adventuring: "I'm retired from adventuring... but you might try the old mine they call 'Rickety Mine' out east along the Blue Road. Another possibility in that direction might be Kemen. It's an old Ayleid ruin. You might also look at Quickwater Cave to the north. I cleared it out, but I haven't been there in years. It might have new tenants." Her friend Magub gro-Orum will back up her claims: "Me? I'm Magub gro-Orum. Borba and me, we were pals in the adventuring trade. Now I help him [sic] run the store." In addition to speaking with Ulene Hlervu about "Cheydinhal" or reading Modern Heretics, you must also have read Martin's copy of The Refugees (the one from First Edition won't do), in order to receive a new "Daedra shrines" conversation topic. 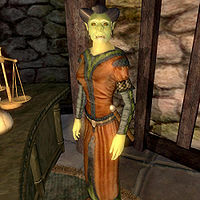 When you speak to Borba about this, she will mark Azura's Shrine and Boethia's Shrine on your map with the words: "A shrine to Azura lies in the Jerall Mountains, far to the north, towards the Skyrim border. And I think there's a shrine to Boethia high in the Valus Mountains southeast of Cheydinhal." Buying a house in Cheydinhal: Purchase a large house in the exclusive end of Cheydinhal. This page was last modified on 7 September 2018, at 19:13.